Please help us find a cure for pediatric brain cancer in memory of Allie "Little Owl" Fisher. 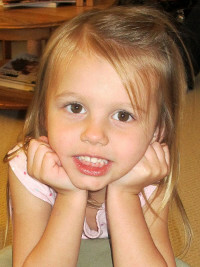 Allie passed away from an inoperable form of brain cancer when she was three years old. Cancer is the number one killer of children and brain cancer has the worst survival rates of them all. Allie's cancer is 100% fatal. Your donation goes directly to support the ground-breaking research efforts of the Children's Brain Tumor Project and brings hope to the children and families suffering from this terrible disease. Thank you for your support to find a cure for this terrible cancer. By clicking the above button you agree to have your debit or credit card or bank account charged by Children’s Brain Tumor Family Foundation. By clicking the above button you agree to submit offline payment to Children’s Brain Tumor Family Foundation. Call 913-636-0635 or email [email protected].